This is an enhanced version of my beer ABV calculator, which now works for both hydrometer and refractometer homebrewers. Please note that the calculations are a little different to those used in the previous version; this is intentional and this new calculator should be more accurate. All the code is available on Github, along with details on the exact formulae being used and where they came from. 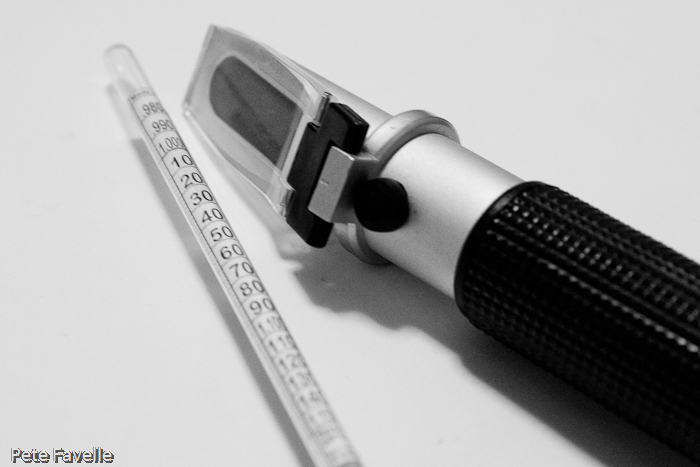 The Wort Correction Factor is generally required for refractometers which measure in Brix; unless you know better, it is best to leave it at the default value. ABV= 131.25*(1.058-1.011) = 6.17 (calculator shows 6.35). When I use OG =1+0,004*B3/1,04= 1.057 (I get the same FG of 1.011 through =1-0,00085683*B3/1,04+0,0034941*F3/1,04) I end up with ABV=6.07 (even lower). The formula used by this calculator for the final ABV sum is a more complex version of “131.25 * difference”, which is intended to be slightly more accurate – especially for higher gravities. It does usually result in a slightly higher ABV than with the simpler formula. The conversion from Brix to SG is also a lot more complex than “1 + 0.004 * Brix” (see the details on the Github page, linked above) – again, those formulae were chosen to be (hopefully) slightly more accurate. Thanks again for the calculator! You’re right – I’ve got some of the formulae listed on that page, but somehow I’ve failed to define (or attribute!) the final refractometer calculation. I shall amend that now. I’m trying to learn the calculations to take 2 brix/refractometer readings and get an ABV. These values may seem weird, but I’m working on a rum ferment… So starting Brix was 36. I checked it after 1 week and it was 24. Plugging those values into your calculator gives me a higher final gravity than my original gravity. How is this? I suspect the major problem is your high Brix values – the formulae used are only really valid for gravities up to around 1.1 (around the 25 Brix mark). Actually, those high values will both generate invalid ABV *and* a faulty final gravity; while their probably are formulae out there that will cover a wider range, they’re pretty horrendous! Thanks for the online calculator. Have checked yours vs actual sp. gravity readings & found it to be the most accurate. Much appreciated tool! Can I use this calculator if I checked the first gravity with a refractometer and I want to check where the gravity is after fermenting for a while and has alcohol within the wine at this point? I’d hate to waste the wine using a hydrometer at this point. You can – the calculator exists for this purpose, because it takes into account the effect the alcohol content has on the refractometer reading. The only caveat is that if you’re making wine rather than beer, the higher alcohol content may result in slight inaccuracies. Thank you very much for the reply. That’s exactly what I’m doing too as the starting gravity was 1.118 for a little over 6 gallons and if all of the sugar has been eaten the alcohol should be around 17%. I’m fine with slight inaccuracies in alcohol, but I’m just trying to see if my wine is finished or if it has stalled. I’ll try it out and let you know how it goes. Thanks again! This is amazing thanks! Measuring with a refractometer I had an OG of 1.047 (slightly off the 1.050 expected), I’ve been racking my brain as to why my beer seemed to get stuck at 1.024 SG after what seemed a fairly good fermentation period of two weeks with plenty of consistent bubbling. This is such a greatly appreciated tool. I’d been fretting over four different all-grain brews, ranging from a Pale Ale, two stouts and a Belgian quad…a backlog I cleared in just one crazy day. Two were familiar brews from my extract days, but two were new recipes. I was thrilled to get high conversion rates, and nail every single SG…but frustrated to see each brew petering-out well above their expected FGs. That was until I punched SG/FG into your calculator, and suddenly my estimated and measured SG/FGs were all dead-on matches, for every single brew. Pete, thanks for your effort and making this calculator available. I’ve also found the Sean Terrill site, and I wonder why, when plugging in OG 18.5 Brix and FG 9 Brix, your calculations give essentially the same OG and GF in gravity (about 1.073 and 1.014) but your ABV is 8.17% while his is 7.6%. Big difference. I see your post on January 9, 2015 (I’m late to the party). Is the idea that your method of calculation is more accurate since this is a high gravity beer? Thanks! Essentially, yes – the “simple” calculation more traditionally used by homebrewers (and the one, I think, that Sean uses) grows increasingly inaccurate as you reach higher ABVs.